Tisza (Sister) River at about the point where Ayla and Jondalar crossed it on their Journey West. 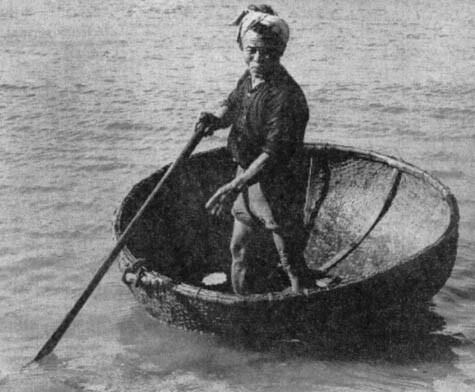 It appears swollen in this photo, but it was a lot faster and higher when they crossed it in their bowl boat. There may well be a dam to control flooding. Per says there was no apparent movement of the water, indicating a dam. There are dikes on both sides of the river at this point. Without the dikes, the water level would only need to rise 50 cm to flood many square kilometres of the flat land which surrounds the area. This is an excellent illustration that it is possible to weave material so that the resulting bowl is waterproof! Jondalar and Ayla's bowl boat used to cross the Sister River (Tisza) was however made of aurochs hide. 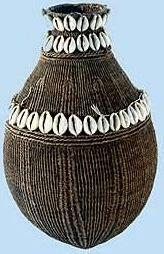 This is one of several types of basketry milk containers made and used by the Borana, a pastoral people who raise cattle in southern Ethiopia and adjacent parts of northern Kenya. The vegetable fibers used in their fabrication are woven very tightly, they are light and extremely durable, and serve as the ideal container for liquids. One of the key characteristics of the gorfa is the application of cowries, small white shells that enhance the beauty of the container. Among the Borana, all women are expected to learn to make woven milk containers like the gorfa. Milk containers themselves are vital objects in a culture where raising cattle is of central importance. The milk that these containers hold is a symbol of abundance. The container's symbolic meaning stems from its structure - in Borana society, weaving is associated with fertility. The container and the milk thus symbolize the ideal combination of abundance and fertility, two fundamental requirements for the reproduction and prosperity of the family and community.